I always crack up when someone askes me if my house is ever a mess. Now I admit that I am a little bit of a clean freak, but there are times when I just don't care. This is what it looks like this weekend. My Son and Grandson are making guitars and they are here using some of DH's tools. So lots of wood all over the place, Nascar on the TV and tons of dust. But look at the wonderful guitar that they've finished. It's gorgeous. The coffee table hasn't escaped either. Lots of templates, tape measures, parts and snacks all over the place. DH has his newspapers scattered all over also. Father teaching Son and some precious shared moments. Dad keeping a watchful eye to make sure it's right. The kitchen island is of course the best place in the world to glue the pieces together. Such a huge mess and I love it. I can always clean it up, but I can never relive these precious moments watching them spending time together and having fun. This has to be one of the biggest of God's Blessings. Hope your day is Blessed too. Love the honesty Marty, and what clever guys you have! Real people live here, right? Real talented people. This is so neat!!! I had my daughter and 4-yr old granddaughter yesterday. And little princess had to "clean the french doors". So I took the curtain down and let her clean away with a wet dish cloth. What we do for our grandchildren ;) I love these memories. Hubby and I were talking after she left about the memories being made. That looks like a very technical project they are working on. I have the same coasters as you from Pier 1 Imports!! Have a great Sunday. Oh Marty... What a special time. And, I so agree, the mess is easily put away, but that day will not be forgotten.... What a sweet family. Now this is what "living" is all about! Time spent together, priceless and is the spice of life! Priorities!! what it's all about!! Guitars, really??? The kind you can play?? I am so impressed!!! Life is good when family abides in your heart and your home! My dad, his brothers, and my brother all play(ed)guitar!I grew up on bluegrass strings! I adore the stabilizer your son and grandson used for their claps and gluing. . . decorating magazines! Evidence that a ladies influence and support was in that room. Also, her love. Thanks for shairng! Even "messy" your house still looks awesome! Mine is always strewn with Sophie's (the dog, although don't call her that because she thinks she's human!) toys everywhere! I pick 'em up, she drags them all back out! LOL! Our houses are made to live in and that looks exactly like what we both are doing ~ living and creating everlasting memories! Love, love, love that guitar! You are blessed with such talented offspring! Hi Marty, I LOVE this post! 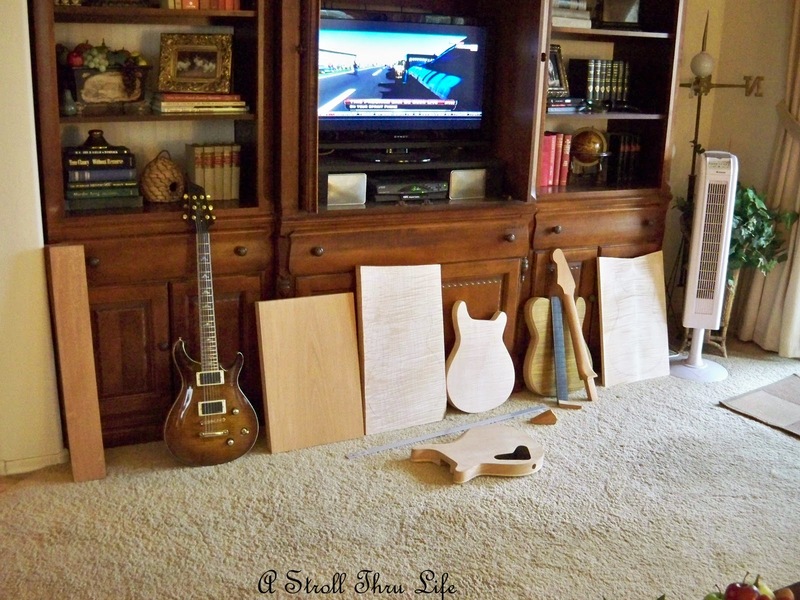 I never even thought about people making guitars at home, or considered how they were made even. 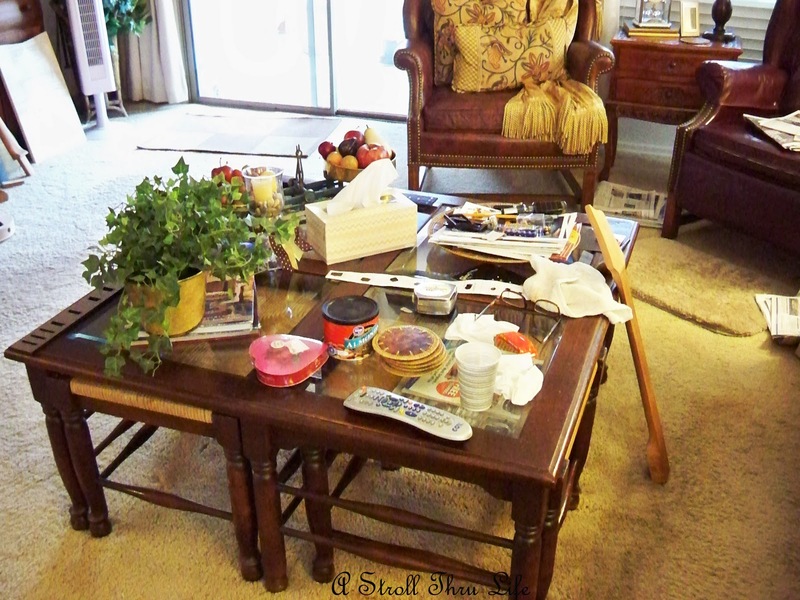 It is fun to see your family and the mess that we all have in our homes every once in a while. We are sitting around in our p.j. 's watching NASCAR too. We aren't that into it yet, but maybe this will be the year. Cute post Marty... Do you realize what magazines they are using???? 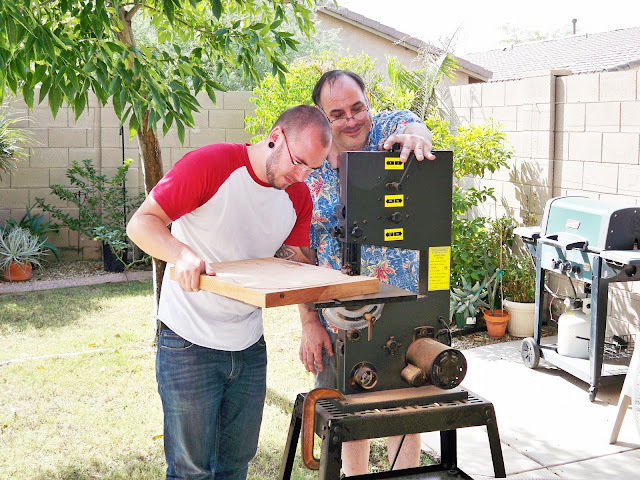 For their project..LOL Thought you might flip out...It's nice to see fathers and sons doing things together. I went up to Home Depot early this morning about 8:30 and it was so nice to see all the Dad's with their little boys out shopping. Have a great Sunday. Hi Marty, I see they confiscated your decorating magazines for the project! I know how proud you must be watching your son and grandson working together. Marty, I do believe that is a mess, but a good mess. Look at the wonderful piece they produced. I see your magazines didn't escape either. I feel so much better about my own home now. Thanks for keeping it real. Have a great weekend and enjoy that race. We've got it on here too. Wow...your guys are really good at crafting guitars! I have seen the process done a few times...it's quite the craft! Girl, you have wood and such all over the place...hehe! You're right...so many great memories being made! I just took a peek at your last post! Ohhh...I love your new English butter slab...it's gorgeous! I'm sooo happy for you, sweet friend...sounds like you got a great bargain for it! It sure does look fabulous in your kitchen and works perfectly for holding your oils! Love it! Have a super Sunday, dear lady! I love it, Marty! Great post!! Just found your blog and have been spending the last few minutes reading old posts. I LOVE your style, particularly how you use silver. I'm a collector, too, and I'm always on the lookout for new pieces at resale shops, thrift stores and garage sales. You have given me some really creative ideas for displaying some of my finds!! Daytona 500 is on the tv here, as well. You are so right! This is what it's really all about! Enjoy the mess! Marty, That is a gorgeous guitar! Your grandson does great art! Those are precious moments Marty. I would soak up every moment. I miss having my children around, they all live in different states. Hi, Marty! I am your newest follower and have loved "strolling" through your site this afternoon. Please, come visit me when you can...p.s. My house looks like this many days...projects...you gotta love 'em! You've made a beautiful home for them Marty, and obviously more than just in the decor sense. It is home and your family is welcome there and you are so right that those are the precious memories. I just had to say that I love the older clamps they are using, the rusty ones with the wood handles! Gorgeous. So is that thick wood for the guitars. I always enjoy reading your posts and looking at your pretty corners and displays. However, this one gave me a big smile because this one says HOME with a capital 'H' and I love it. This is your best Tablescape yet! That guitar is a beautiful work of art - they are very talented. I only wish my house looked "Messy" like yours! Lol! It's starting to look like a used furniture storage space...and I am NOT ever gonna share it! And it's also NOT because those I love are making beautiful things (or memories) either! *winks* That guitar looks amazing! What a precious post. There is nothing like family. Looks like a mighty happy home with folks who love to be together.. No perfect scape of any kind can compete with these lovely photos of love in action. thanks for sharing and I may need some help choosing plants for my back wall in a couple months. yours look great~! What wonderful moments! Great blog. But oh my, they're using your magazines! Gotta be real sometimes though. I just love the views of your backyard. I think it's so cozy back there. I am also a NEAT Knick and a bit of a clean friek, as I get older, I say Aww...who cares and lets live life to the fullest!! So I LOVE LOVE this post!! So true and what great memories!!! The best kind of messes, Marty! Your house looks a lot like mine, minus the guitars, which are awesome!! Seems I am always picking up after others! A beautiful mess! Making guitars is pretty cool and a house is meant to be lived in! What a great talent to be able to make such a beautiful guitar!!!! 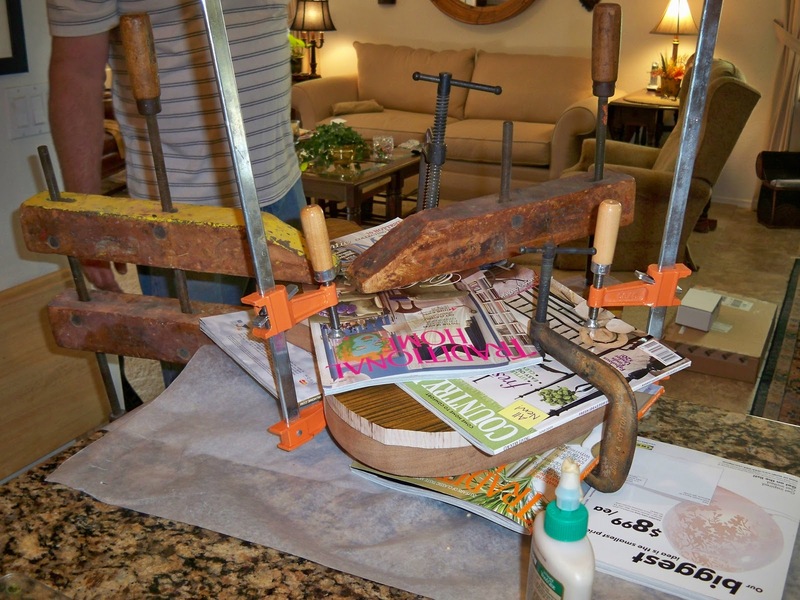 Love the old, old clamps they're using too! Great project and what great bonding time together! Oh Marty I would love for my house to be in a mess (which yours is definitely not!) just to have my guys home. How blessed that your guys are nearby and come to your home to play!!! I got to see Jonathan when I was down for Mom's B-day. He surprised me when I saw him- he had cut his dreg locks off that day! Gosh he looks so cute with that short messy hair but it is kind of funny - I really grew to love those locks on him! Blessings to you Marty!! I wholeheartedly agree with your philosophy; a clean house is so nice, but creating memories and touching hearts is the most important part of our homes!! How cool - making a guitar! My husband makes cigar box guitars and has always wanted to make a guitar from scratch. I'll have to show him your post! You are so nice to let them go at it! I gave you a shout out today, stop on by to help us celebrate. How are you doing, sweetie? Oh, I loved seeing your family and your house! Post of the Day: A Retreat in Brazil/ Britney Spears' New House. Marty, you are a patient mom/grandmother. Looks like they are pretty talented guys. I don't suspect it is easy to make a guitar. What an accomplishment! Awww...isn't that the beauty of Diy projects! many times we do them with the ones we love! Love that the family time is more important than a mess. Warms my heart. OK that cracked me up - kitchen island only place to glue! And wow can't wait to see how the guitars turn out!! Ohhhhhhhhhhhhh, Marty, you just made my day with this! I laughed like crazy. Thank you for keeping it real, because you know we all always feel like the only ones with messy houses. WARNING! Tarn-X tarnish remover WILL damage your silver! Read about and see the results here: http://www.hermansilver.com/tarn-x.htm.